The application period for the 2019 delta v program has closed. The NYC Startup Studio is the program for the MIT delta v accelerator based in Manhattan. The program is run in parallel with the Trust Center-based accelerator, but is geared for teams and ventures interested in being exposed to and taking advantage of New York City’s unique entrepreneurial community. Student startup teams work on their businesses full-time from June to the end of August, receiving a rigorous educational and mentorship-based accelerator experience. New York was selected as the first beachhead to expand MIT delta v because of its vibrant community of specific industries such as FinTech, real estate, fashion tech, enterprise tech, media & advertising, and publishing just to name a few. Led by NYC Managing Director Carly Chase, teams have access to New York-based industry leaders and mentors and the prospect to be fully immersed in the city’s entrepreneurial and technology communities, including off-site visits and events to venture capital firms, companies, and relevant meet-ups to opportunities to listen and learn from inspiring speakers on startup topics. In addition, Bill Aulet and the Trust Center Entrepreneurs-in-Residence regularly visit during the summer. In addition, you can read the FAQ and Application Guideline pages for further background and eligibility. 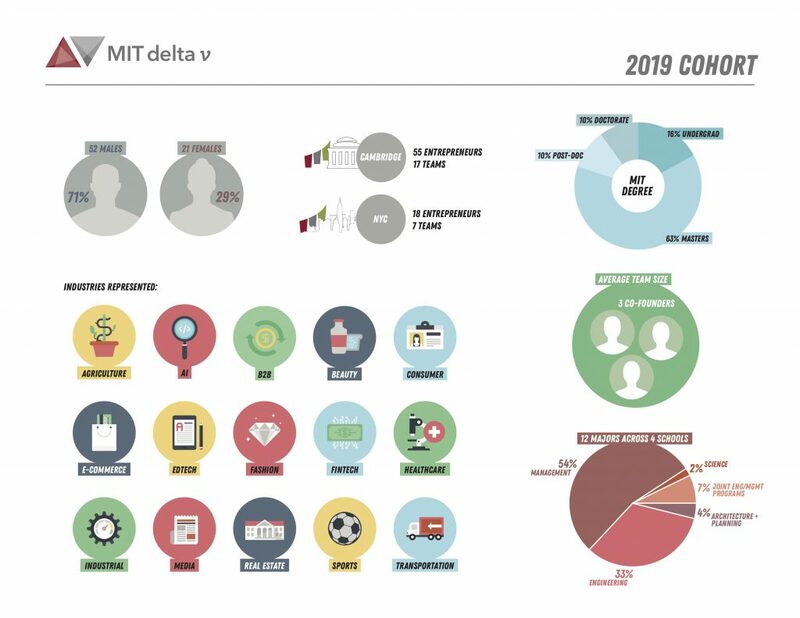 The infographic below represents the student entrepreneurs and teams that were accepted into the MIT delta v program in Cambridge and New York City that will be taking part in the program this summer.